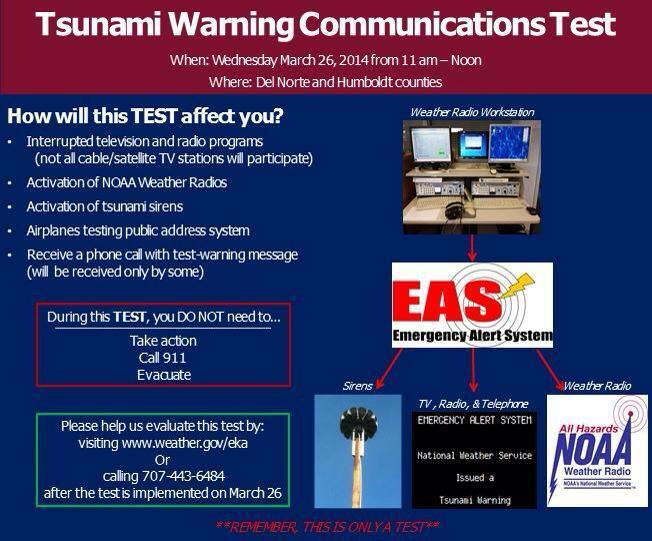 What does the Tsunami Communications Test mean to you? From 11 am to noon, you may see Emergency Alert System (EAS) messages scrolling across your tv screens, hear messages on the radio or NOAA weather/emergency alert radios, or see air patrol in the sky. For areas of the county prone to tsunamis you may receive a "Reverse 911" call sending a test phone call alert, or hear a siren if you live in a tsunami prone area. The campus is not in a tsunami evacuation zone. Refer to link below for Tsunami Evacuation Maps. Tsunami Awareness Week is March 23rd and runs through March 29th for Humboldt and Del Norte counties. A series of events and tests are being conducted this week to help teach communities living in tsunami prone areas how to survive. Please learn more about what you can do to prepare for tsunamis and know your zones. Access the links provided below.